One prototype of the Mark V Stage 88 may have been built, but if it was, it wound up in the dumpster. The Mk5's are a bit rare, but very fast and light. Chick Corea has the only 88 ever made. Can any one confirm where should I place the thinnest spring and the thickest , for example with the 73 tone bar mounting? Don't know exactly if the thinnest has to be near the key or near the tine. I understand that the thickest is a constant with all tone bars in an specific way. The thicker spring goes towards the tine, the thinner spring goes towards the back of the tonebar, closest to the player. In this image, you can see the thicker spring with no color, and the red thinner spring on the back. 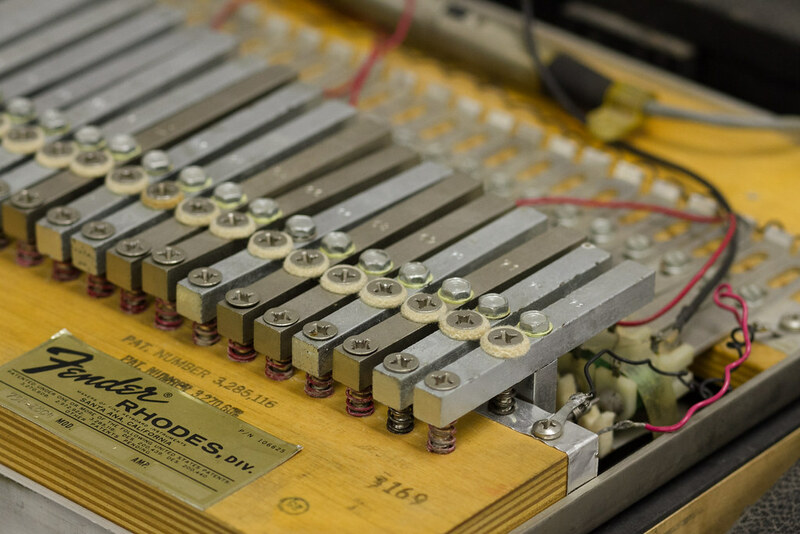 Your piano may have the thinner springs colored blue instead. Now I can continue with the restoration. Keys 54-73 Blue springs on the escapement (end) screw and natural springs on the voicing side. This piano has mostly original parts...I don't think that it has ever been completely stripped down. I'm trying the McMaster tonebar screw and grommet replacements for the first time and it's working well. As long as we're re-visiting this old thread, my June 1974 Mark I Stage (with tonebars marked 1-73) is as-described above, except that the all natural springs section extends through key 60. Starting at key 61, I have thinner blue springs for escapement (closest to the player) and thicker natural springs for voicing.